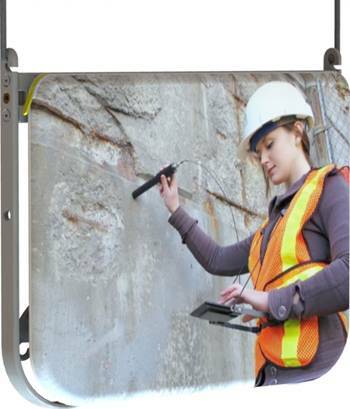 Skanska is a leading global construction company that increasingly relies on tablets for jobsite management. 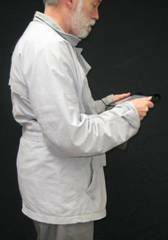 Over the past 18 months they’ve been testing GoPads and helping VTI evolve our product to meet their demanding requirement. The two photos above were taken at Skanska’s office in Oslo, where Øivind Pettersen leads their mobile computing group. 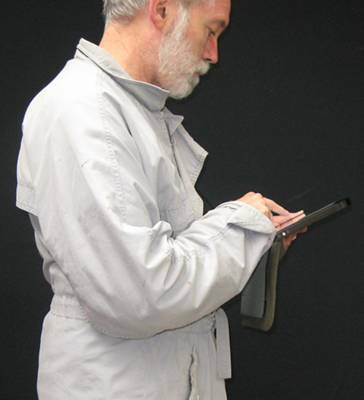 The image on the left shows him wearing one of the 1000 original GoPads that VTI test-marketed in 2014. 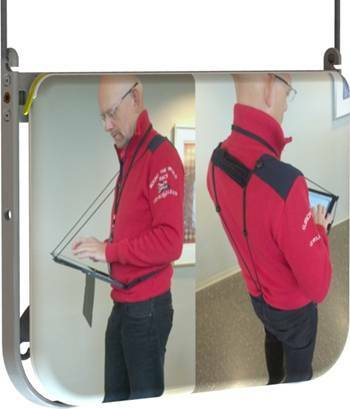 The image on the right shows him wearing the latest GoPad, which VTI is launching in Q3 of 2016. 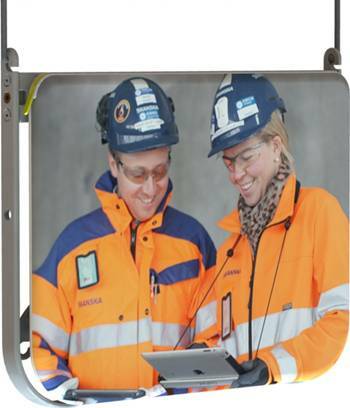 This photo shows a first-generation GoPad being used by Skanska staff. Compared to hand-holding their tablet in a protective box, they were very receptive to the idea of wearing it hands-free in a GoPad. Initial test results were promising however users experienced problems that needed to be fixed. 1) Apart from the GoPad’s “It looks too geeky” problem, the main complaint from users was that neckstrap pressure made it uncomfortable to wear for long periods. 2) Another ergonomic problem (which is evident in this photo) was that the neckstrap cords partially obstructed side-access to the touchscreen. 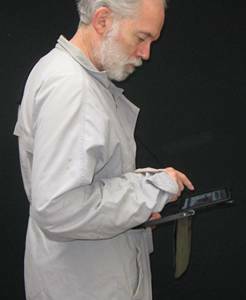 3) First-generation GoPads were installed by gripping the tablet with clamps and users wanted a more elegant solution. 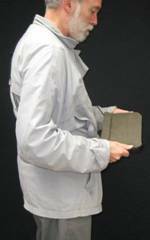 4) They also expressed concerns that the tablet needed better protection for use on hazardous job sites. The image on the left illustrates how the new GoPad uses fairleads to re-route the neckstrap cords. The new mechanism folds instantly to store the tablet yet provides unobstructed side-access to the touchscreen. The image on the right shows GoPad’s earlier version of the body-harness. It eliminates long-term wearing discomfort by hooking onto the neckstrap and anchoring it to the user’s belt. The exploded CAD graphic on the left illustrates how the tablet snaps into a new mounting shell for easier installation. 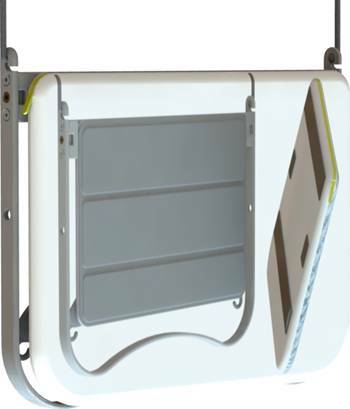 The shell also protects the back of the tablet and the hinged screen-cover swings around to completely enclose it. The CAD image on the right shows the same GoPad however its new “GoBag” accessory is removed for visual clarity. The underlying screen-protector is visible and shown closed over the tablet to give it total protection. o It’s impossible to drop a GoPad while it’s being worn. o If somehow it does get dropped, the closed aluminum swingarm acts as a shock-protection cage. o While the GoBag is attached to the screen-protector, it adds yet another layer of shock-protection (see Slide 7). 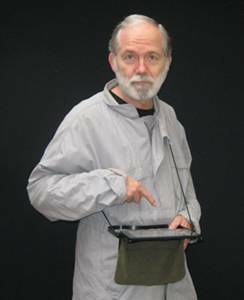 o The GoBag disguises the valuable tablet so that it’s harder for thieves to identify and target (see Slide 21). o The closed swingarm also provides a secure handle for hand-carrying the tablet like a briefcase. o To facilitate hand-carrying and desktop use, the neckstrap is now detachable and can be stored inside the GoBag. o The closed swingarm also provides a secure grip while using the tablet’s touchscreen (see Slide 10). o The new swingarm has ¼”-20 threaded holes that mount the GoPad securely onto a camera tripod (see GoCam). The left image illustrates two GoBags: one is orange and one is white … do you see both of them? The GoPad’s folding screen-protector is covered with Velcro Loop fabric. Those Velcro Loops mate with Velcro Hook patches sewn onto the back of each GoBag. Being attached with Velcro enables different styles of GoBag to be interchanged in seconds. To understand the impact that GoBag interchangeability has on fashion see slide 23. To better understand how the GoPad works, watch this early instructional video. The two photos on the left illustrate why “FannyPack Mode” is best suited for high-productivity work applications such as construction engineering. 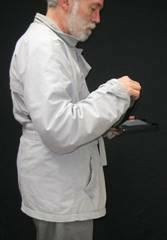 This wearing mode enables very robust hands-free mobility however it does so at the expense of forcing the user to look somewhat “Geeky”. The photo on the right shows why the GoPad’s new “Shoulderbag Mode” is better suited for applications that only require casual access to the tablet (brief mobile web access, Skyping, texting etc). 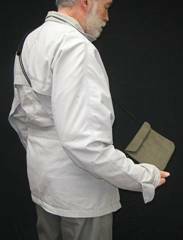 Now, instead of looking geeky, GoPad users can wear a simple and practical shoulderbag that looks amazingly cool. is faster and easier to use than a smartphone! It takes less than 4 seconds to: swing the shoulderbag up, open it, use the tablet’s touchscreen and return it to shoulderbag mode. That’s faster than most smartphone users can even find their “Tiny Tablet”stored in a pocket or purse. 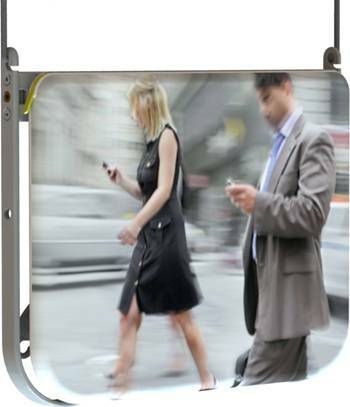 The GoPad/GoBag worn in Shoulderbag Mode outperforms any smartphone… it’s the biggest and smartest smartphone ever! WOW… those two mobile usage modes are amazing! But what happens when a GoPad user stops moving? The left GoBag graphic illustrates how the ultra-mobile wearable tablet transforms into an ultra-productive desktop computer. The right photo shows why GoPad users always enjoy perfect ergonomics, regardless of their activity, posture or location.